Main theme: in each case a bird perching on a bough of flowering prunus with bamboo and rock. The integral porcelain bases or stands [are] painted in formal style to simulate wood. The marked difference of style in which the decorative subject is executed by two separate artists should be noted. Two technical features are the iridescent halo on the glaze surrounding the blue over-glaze enamel and the tendency for the latter to flake; both are often considered to be characteristic of late 17th century porcelain decorated in 'famille verte' style. The most celebrated product of the great reigns of the early Qing dynasty emperors was porcelain: vast amounts were produced in the imperial kilns at Jingdezhen. 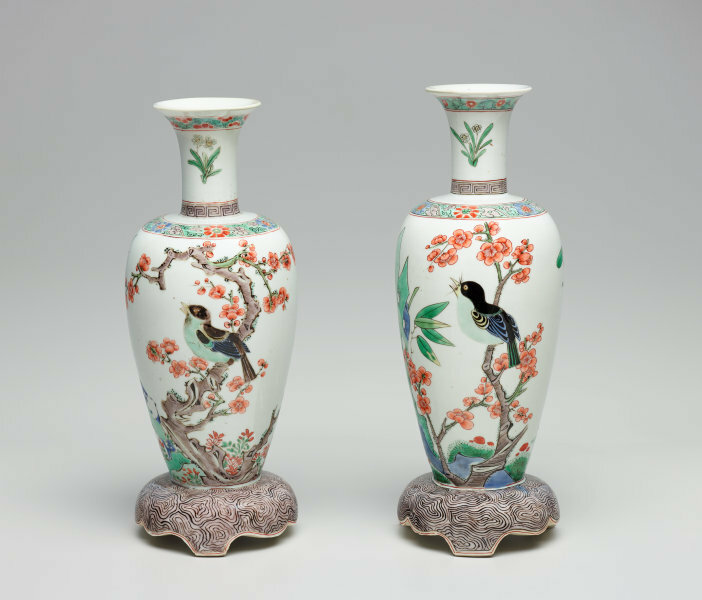 Porcelains such as these were distinguished by their infinite variety and supreme technical dexterity. The term 'famille verte', coined by the nineteenth-century French collector Jules Jacquemart, acknowledges the impact of shades of green in the painted enamel decoration. Such wares - developed from the 'wucai' or 'five-colour' painted enamel porcelain of the previous Ming dynasty - rapidly became popular in the early Qing, particularly during the reign of the Kangxi emperor. Not only were they produced for the Manchu imperial court in Beijing; their ready appeal and highly coloured exotic decoration made 'famille verte' porcelains popular in the courts of European nobility. These vases - decorated with patterns of a singing bird perched on a prunus tree, surrounded by fantastic rock formations are very much in the Chinese style. The bases are painted in manganese and black to simulate wood. Art Gallery Handbook, 1999. pg. 257.